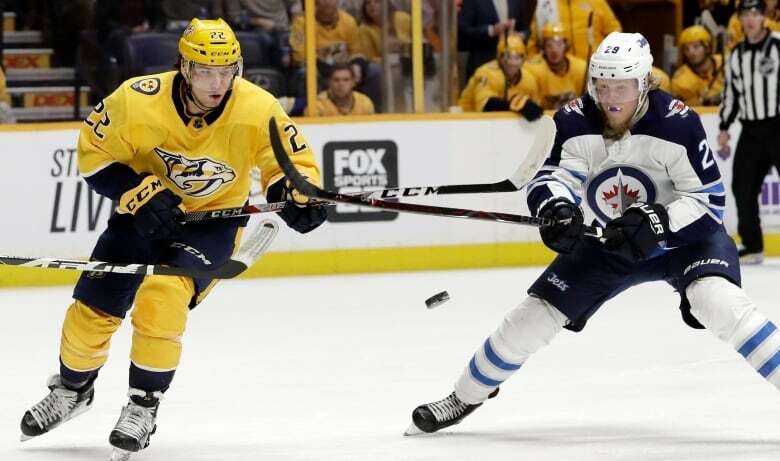 Nashville goalie Pekka Rinne stopped 32 of 33 shots, and the Predators pulled away for a 3-1 win over the visiting Winnipeg Jets on Tuesday night at Bridgestone Arena. ​Facing a tired team, the Nashville Predators jumped on Winnipeg early. Pekka Rinne made 32 saves and the surging Predators scored two short-handed goals in beating the Jets 3-1 on Tuesday night to tie for the top spot in the NHL standings. 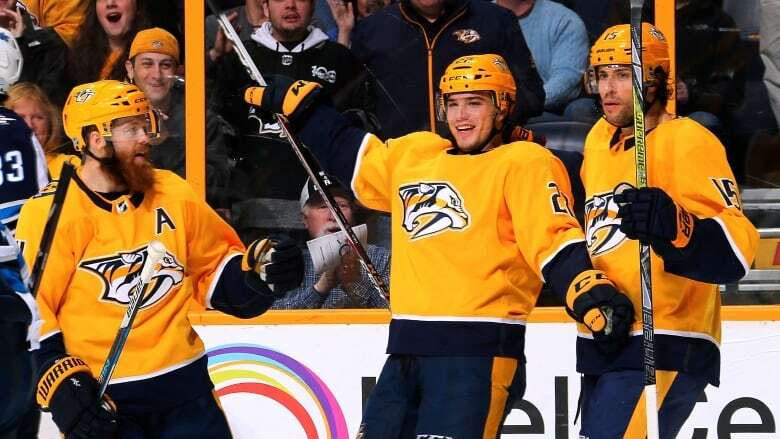 Kevin Fiala, Austin Watson and Viktor Arvidsson had the goals for Nashville, which has won 11 of 12. The Predators reached 100 points in 69 games, the fastest mark in franchise history. The defending Western Conference champions are even with Eastern Conference-leading Tampa Bay — and Nashville has played one fewer game. Kyle Connor scored for the Jets, losers of three straight. Winnipeg fell eight points behind the first-place Predators in the Central Division. "We had marked it as a game that had to go our way as we sit here and push toward it late in the season," Nashville coach Peter Laviolette said. "Trying to battle for what we need to do in order to better ourselves for the playoffs and obviously the division and the conference. Those are things we talk about, so the two points were very important." Nashville scored three goals before the game was nine minutes old. 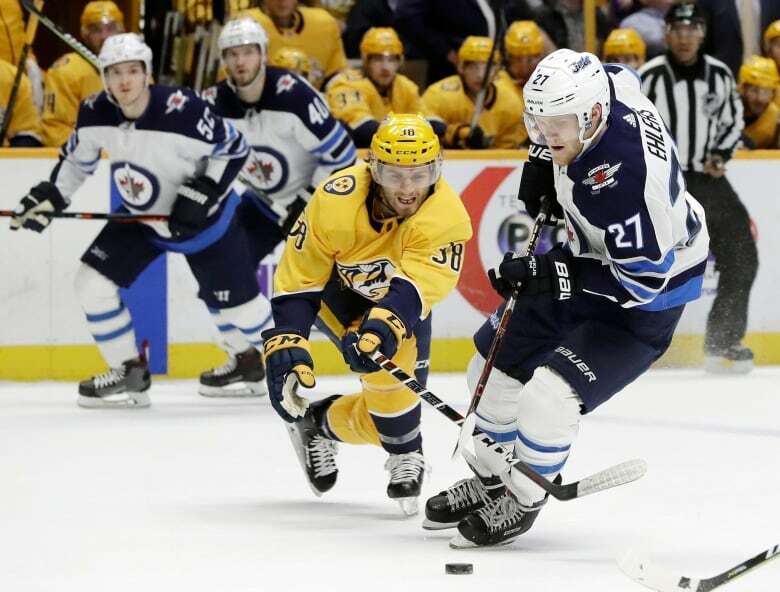 Playing the finale of a six-game road trip, their longest of the season — and their second game in two nights — the Jets came out sluggish against the speedy Predators. Fiala scored the first goal at 2:48 of the opening period. Roman Josi carried the puck up centre ice before sending a pass to Kyle Turris on the right side. Turris returned the pass to Josi as he continued through the slot and he immediately fed a trailing Fiala with a backhand pass. He had an open net, and he buried a snap shot up high for his 22nd goal of the season. "I think every season you play, you want to climb up in the standings," Josi said. "You want to finish as high as you can. It's definitely one of our goals. It's huge for the playoffs to get that home-ice advantage. It's definitely on our mind and we want to stay there now and get better." Watson and Arvidsson scored short-handed goals 34 seconds apart on the same penalty kill to make it 3-0. It was the first time in Predators history that they scored short-handed twice on the same power play. "Right now, the team is playing great," Watson said. "Our penalty kill has done a good job of taking away time and space and forcing turnovers. When you get a chance to jump on it, it's nice. Every time a couple go in for you, it helps." Jets coach Paul Maurice called a basketball-style timeout following Arvidsson's goal. Following the stoppage, Connor Hellebuyck took over in goal for starter Michael Hutchinson. After the first period, the team announced that Hutchinson would not return due to an upper-body injury. Hutchinson stopped 12 of the 15 shots he faced in 8:45 of action. Nashville poured 24 shots on the Winnipeg net in the first, its most in a period this season. After the first, Winnipeg founds its legs and put 27 shots on Rinne in the final two periods. "In a tough situation, I really liked the way we stayed with it," Maurice said. "There wasn't anything easy there for us tonight. The bench was good. They kept battling and we kind of shut the game down well in the second period, which is hard to do, and had a good push in the third. That's what I'm taking from this one." Hellebuyck made 30 saves in relief. Connor got Winnipeg on the scoreboard at 1:08 of the third with a power-play goal when he tapped in the rebound of Blake Wheeler's shot from the right side. "I saw a team that was down about half their players and playing the back end of a back-to-back," Jets captain Blake Wheeler said of his team. "We went into a tough overtime last night. We knew the first was going to be tough for us. They came out hot." Patrik Laine picked up an assist on Connor's goal, extending his franchise-record point streak to 13 games. Watson also did some strong work in his defensive zone to help Rinne. With just more than eight minutes gone in the third, he cleared a puck that was headed into the net after Rinne got a piece of a shot from Laine.